Mega Man is the legendary Blue Bomber-the boy robot turned hero! One of video game’s first icons, he’s now one of comic books’ greatest heroes! It all began when the nefarious Dr. Wily stole Dr. Light’s eight Robot Masters and turned them against the world! Helper-bot Rock had himself turned into Mega Man—the super fighting robot-to save the day! Dr. Wily wouldn’t go down without a fight, though, and built eight combat-specific Robot Masters just to destroy Mega Man—from without or within! Now Mega Man must fight to save the world and himself! 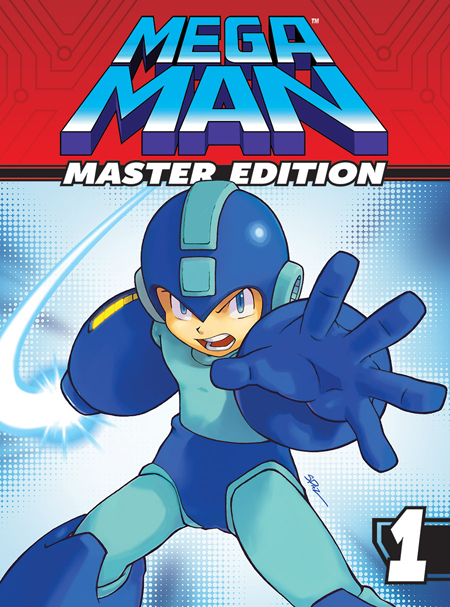 MEGA MAN: MASTER EDITION vol.1 collects the first three epic storylines, covering Mega Man #1-12. I don't know why, but I just immediately burst into like 30 seconds of laughter when I read that letter. "The Blue Bomber may be dead, but here's some Blue Blur as compensation!" It's like... "No no, that's okay. You keep the money and that comic. I'm good." Still, it's better that Mega Man dies young instead of getting old and stale and having a crossover with The Maxx or something weird like that. Though I have to say, that Sharknado cross-over the Archie series did was pretty funny. I have to say it's done. I like to be positive and think that only refers to volume 1, with volume 2 coming in 20XX. Well, I guess it means RIP to the original graphic novel line. Volumes 9-11 constantly being pushed back with no release in site. These Master Editions will most likely take their place. So does that include the sonic and megaman crossover for future volumes?